So some of you may know (I mean I rarely talk about it...) but cutting off my hair last September was probably one of my biggest regrets. You know when you look back through all your pictures and you see how you used to look and you end up thinking "why on earth did i ever think that was a good idea?". Well that's been my thought pretty much non-stop for the last six months. Now I appreciate it has grown a fair amount, however there is a long way to go before it's back to my desired length. So I need all the help I can get. 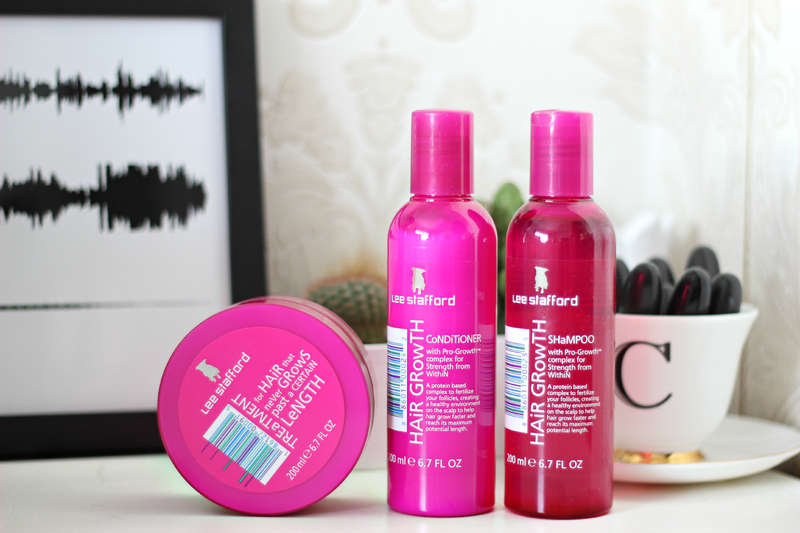 It seems Lee Stafford decided to swoop in and come to the rescue by answering all my social media pleas for longer hair, and were kind enough to send me some products to try. I was under no obligation to review them but after having such a positive experience with them so far I thought I'd give them a shoutout. Cutting your hair off may not be the reason to buy Lee Stafford's Hair Growth Collection as bleaching hair stunts growth and stress can also. The products are designed to reduce irritation and moisturise the scalp, providing the prefect base for hair to grow and reach its maximum potential length. Not only that but it's great as it doesn't cost you an arm and a leg to invest in (3 for 2 in Boots at the moment - thank me later). We already lose so many hairs on a daily basis; especially with being blonde I find I'm practically moulting. Having all the help we can get from our hair products so that our hair and scalp are in the best condition can help you reduce hair loss. I cannot recommend this product enough, it's been a total life saviour for me. Now the condition of my hair is better I'm just hoping it keeps growing and growing and growing and growing. You get the picture. I love Lee Stafford products. The scent is incredible! I've bought that hair mask so many times! LOVE the smell of these. And your hair DOES look awesome short as well as long, so happy days! Absolutely in love with these products! They always leave my hair so soft and smell amazing! I personally think you look lovely short. However, I know and can appreciate it's down to you. Thank you very much for written this article. This is very helpful to people who have hair problems. How to stop hair fall out of your head doesn't make a sound. But the effect it has on your psyche is as loud as a thunderbolt. The good part, though, is that you don't have to accept this as a irreversible condition. Yes, male pattern baldness can run in families, but even so you can find a product to help.